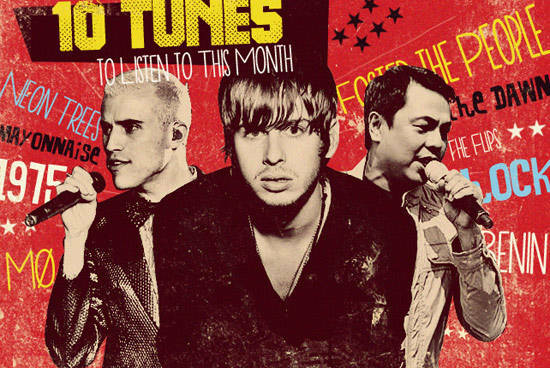 Put new music from Neon Trees, Foster the People, The Dawn, and more on your playlist this month! (SPOT.ph) This February, we have tracks you’ll love. Check out Neon Trees’ ode to friends with benefits, Foster the People’s comeback track, The 1975’s sensual indie-rock release, Chromeo and Toro y Moi’s funky collab, and MØ’s dance anthem. The Dawn and Slapshock pay tribute to Yolanda survivors in their rock ditties, while Mayonnaise, Jensen and The Flips, and Clara Benin bring you more mush with their sweet singles. Song: "Sleeping with a Friend"
An ode to friends with benefits - that’s Neon Trees’ first offering off their forthcoming third LP. "Sleeping with a Friend" is an electro-pop-rock gem with a steady build-up and huge, jangly chorus. These Utah-based rockers don't need outrageous club beats and thumping bass to sing about clandestine affairs. Fun fact: Pop Psychology, Neon Trees’ new album, drops April 22, 2014. For all the lonely hearts this coming V-Day, Mayonnaise has "Paraan," a song to bring out all your feels. The band has come a long way since its launch in 2004. Today, through this single, they prove that their sound is tighter, and their music more mature. Fun fact: Mayonnaise was the Grand Prize winner of the Red Horse Muziklaban back in 2004. They’re back, with a catchy tune to boot. Foster the People welcomed 2014 with a new single titled "Coming of Age" from their forthcoming sophomore album, Supermodel. This one’s no "Pumped Up Kicks," but it previews a new, refreshing sound from the indie trio. Fun fact: On October 6, 2012, the indie-pop band performed live at the Araneta Coliseum in Quezon City. One of the country’s most influential rock bands is out with "Tibay ng Pinas," an inspiring, energy-filled track especially written for the survivors of Super Typhoon Yolanda. The Dawn never fails to stay relevant while making good music. Fun fact: The Dawn has released 14 albums since it started in 1986. The 1975 merges ’80s sound with modern synth in their latest release titled "Settle Down." Matthew Healy sounds subtly sensual set against the track's indie-rock arrangement. This catchy ditty, which speaks about addictive and chaotic attraction, will get you hooked, too. Fun fact: The Manchester-based, indie-rock band consists of Matthew Healy (vocals and guitar), Adam Hann (guitar), George Daniel (drums), and Ross MacDonald (bass). Here’s a tune you can play on that V-Day date. "Stay with Me" is soulful, and Jensen Gomez is a revelation. Listen as his smooth vocals glide through this love track's sweet guitars. Fun fact: The band formally launches on February 12, 2014 at Saguijo. Electro acts Chromeo and Toro y Moi collaborate to produce this irresistibly funky tune. The single, off the Chromeo duo's forthcoming album titled White Women, features Toro y Moi's vocals and indie sensibilities paired with Chromeo's glossy sounds. Fun fact: Toro y Moi, also known as Chaz Bundick, is part Filipino. The recording artist/producer was born in the US to a Filipino mother and an African-American father. Here is another tribute to the strong and resilient Filipino spirit. Local act Slapshock teams up with JD of Pop Shuvit in this hard-hitting track. In the music video, heavy rock sounds are paired with poignant portraits of Yolanda survivors, creating one powerful composition. Fun fact: The song can be purchased online, and all proceeds will be used to support the rebuilding efforts through #HelpPH. "Don’t Wanna Dance," in contrast to its title, is massively dance-y. The track starts off as a usual MØ tune - trippy vocals with a side of experimental electronics. Wait until the chorus, though, for an explosion of party-ready beats. Fun fact: MØ’s No Mythologies to Follow debut is set for release on March 10, 2014. We’re glad we stumbled upon this effortlessly lovely track. Clara Benin’s clean vocals and the simple arrangement make this tune so easy to fall for. Fun fact: Clara Benin studies music in Meridian International (MINT) College.